The history of our core product, Concentrated Multipurpose Cleaner was introduced to the Malaysian market in 1997. Subsequently, Procrystal Brands (M) Sdn Bhd was established to expand our product range to penetrate the Car Care business. Our business strategies are mainly focused in field promotion via promotion counters at various large and small exhibitions held locally. We have made presence in major exhibitions such as KL International Motor Show 2003. Apart from major exhibition events, our promotion counters can also be spotted in hypermarkets and supermarkets. After years of sheer hard work, Procrystal Brands (M) Sdn Bhd has grown and penetrated into international market like China , Hong Kong and Indonesia . Our commitment has broadened the sales network nationwide through international and domestic chain stores. 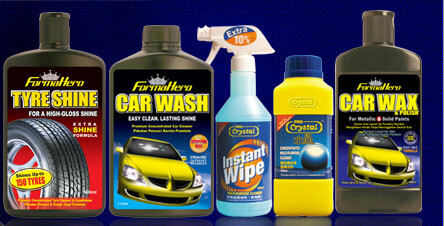 The brand FORMAHERO™ carries the car care chemical cleaning products line up, and the brand PROCRYSTAL™ supports the industrial and household product range.